If you don't want an iPad, the ASUS Eee Pad Transformer Prime is the tablet you do want. It has a great design, a nifty keyboard dock, slick, up-to-date software and great performance. The lack of 3G is a pain and there are a couple of other issues that need ironing out, but all in all the Transformer Prime is the best Android tablet on the market. A quad-core processor, Google's Ice Cream Sandwich software, an ultra-slim design and a handy keyboard dock that provides up to 18 hours of battery life. These are essentially the key points of the ASUS Eee Pad Transformer Prime Android tablet, a successor to the original Eee Pad Transformer. Although the keyboard dock isn't perfect, the combination of improved software and a gorgeous design make the Transformer Prime the current king of Android tablets. The ASUS Eee Pad Transformer Prime sounds like it belongs in a Transformers movie, but the device obviously gets its name from the keyboard dock which can be detached from the tablet itself. In Australia, ASUS sells the tablet and the keyboard dock together as a bundle, so unlike other markets, you can't purchase the Transformer Prime without the dock. Although this adds plenty of functionality, including a physical keyboard and a built-in battery, it does significantly raise the cost of the unit. The Transformer Prime's dock is one of its key features but there is plenty to like about this tablet without it. For starters, the Transformer Prime is just 8.33mm thin and weighs only 586g. Yes, that's thinner and lighter than the market leading iPad 2 and even thinner than the Samsung Galaxy Tab 10.1. The latter is admittedly 21g lighter, but this doesn't make a huge amount of difference in day-to-day use. 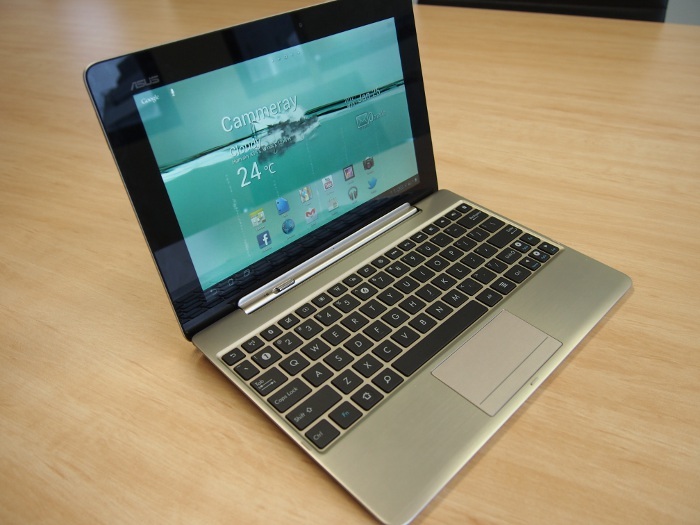 ASUS deserves plenty of plaudits for the Transformer Prime's build quality. The back of the tablet is constructed from sturdy feeling aluminum and has an attractive swirl design (Australian models of the tablet are available in a "Champagne Gold" colour). This design is borrowed directly from the company's ZenBook ultrabook notebook. Unlike the original Transformer, the aluminium backing exhibits little to no flex when some force is applied and it doesn't creak or rattle. The bezel surrounding the screen is rather large and does quickly become a fingerprint magnet, however, and the metal edges can dig into your fingers. Our only other complaint with the design is the position of the speaker — when holding the tablet with two hands your right hand covers it almost entirely, effectively muffling the sound. At 10.1in, the Eee Pad Transformer Prime's screen is the same size as most Android tablets, though ASUS has opted for what it calls a Super IPS+ (In Plane Switching) LCD panel. The screen is bright, crisp and clear and feels smooth to swipe. It also has very impressive viewing angles. At full brightness ASUS claims the Transformer Prime is ideal for outdoor use: we found it significantly brighter than most other tablets on the market. To save battery life when using the Transformer Prime indoors, you can disable the Super IPS+ mode to extend the battery life. This is a handy, one-touch option in the quick settings menu. 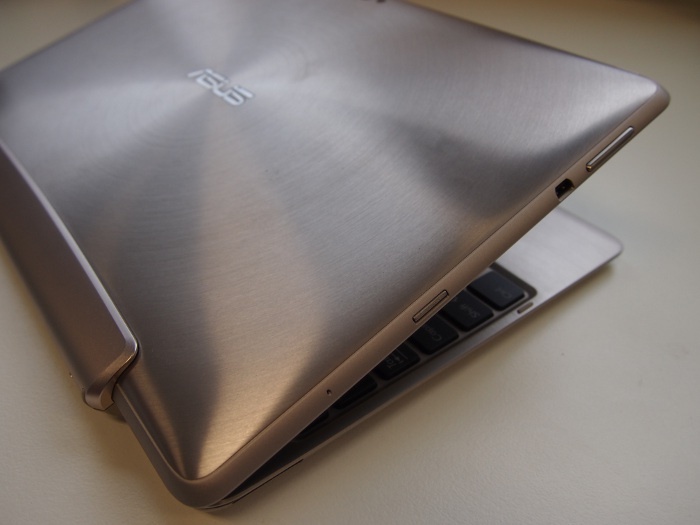 Without the dock, the ASUS Eee Pad Transformer Prime doesn't have a full-sized USB port or a micro USB connector. On the left side you'll find a volume rocker, a micro-HDMI port, and a microSD card slot, while the top edge houses a small power/lock button and the right side a standard 3.5mm headphone jack. The proprietary ASUS dock connection may be an annoyance, but it offers two benefits: it connects the tablet to the keyboard dock, and charges much faster (around an hour and a half) than a regular micro USB charger would. Either side of the dock are two holes that attach to the dock: they come with rubber inserts, so you'll need to remove these before you attempt to dock the tablet. Like it's predecessor, the ASUS Eee Pad Transformer Prime really comes into its own when it's connected to the included keyboard dock. The dock adds a full-sized USB port, a full-sized SD card slot and a trackpad, as well as its own built-in battery. ASUS says the battery offers an additional six hours of use. If both the tablet and the keyboard dock batteries are fully charged, the Transformer Prime draws power from the keyboard dock first in order to preserve power for tablet-only use. 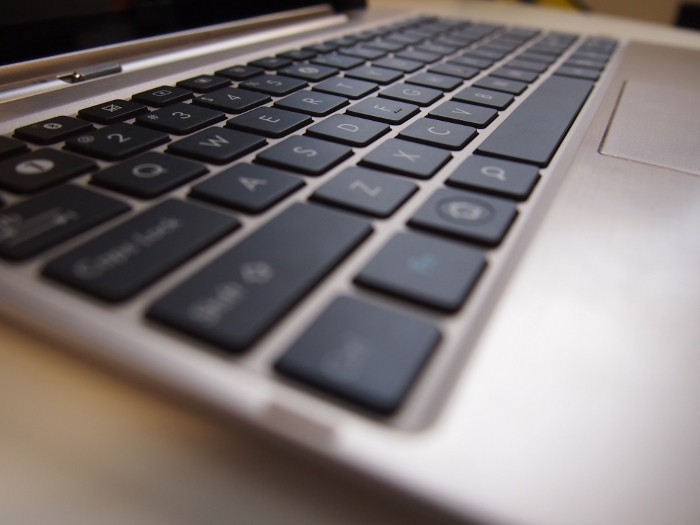 When connected, the Eee Pad Transformer Prime folds over onto the keyboard dock and acts like a regular notebook. Connecting the two does feel a little clunky, though the arrows on both the dock and the tablet are a nice touch: line them up to ensure a smooth and hassle-free connection. The Transformer Prime's keyboard makes typing easier and more effective than any touchscreen, but it's not without faults. The keys aren't backlit, which makes typing at night time rather difficult, and they are also pretty small and cramped. We did like the travel on them though, and tactility is better than many netbooks of similar size. We love the addition of dedicated Android shortcuts including home, back, search and settings keys, along with a wealth of quick toggles for the trackpad, Wi-Fi, Bluetooth, brightness, Browser, screen shot and media controls. There's also a button on the keyboard to lock the screen, which is handy if you want to keep the Transformer Prime in its open position. The Transformer Prime's keyboard dock also has a touchpad, and you can use two fingers on it to scroll up and down on Web pages. It's very easy to accidentally bump when typing though, so we suggest turning it off via the shortcut button when you aren't using it. We would have appreciated an automatic setting that disabled the trackpad when you type. You can't use gestures on the Transformer Prime's trackpad, so pinching to zoom, for example, can only be performed on the screen. Unfortunately, the Eee Pad Transformer Prime is very top-heavy, so it's almost impossible to position it on your lap without it toppling over. It's fine for use on a desk or table, but trying to sit it on your lap is a delicate process.